Organic carbamates are the stable class of compounds derived from the unstable carbamic acid having O-CO-NH- linkage [1,2] with unique applications in the field of pharmaceuticals, agrochemicals (pesticides, herbicides, insecticides, fungicides etc. ), intermediates in organic synthesis, in the forms of drugs and prodrugs, for the protection of amino groups in peptide chemistry, as a useful synthons, as linkers in combinatorial chemistry and also have interesting medicinal and biological properties . In recent years, several reports have indicated that carbamate linkage present in between the active pharmacophores of various structurally diverse molecules increases manifold biological activities of semisynthetic/synthetic natural/synthetic molecules and proved to be a boon against various disease such as anti-cancer, anti-bacterial, anti-fungal, anti-malarial, anti-viral, anti-HIV, antiestrogenic, anti-progestational, anti-osteoporosis, antinflammatory, anti-filarial, anti-tubercular, anti-diabetic, anti-obesity, anticonvulsant, anti-helminthes, Alzheimer disease, CNS and CVS active etc. [4,5]. In recent years, several workers from the different part of the world have incorporated carbamates in between the active pharmacophores of structurally diverse natural products and realized that carbamates play a crucial role in increasing the biological activity of these molecules. We have found that several carbamates derivatives of natural products have emerged as potent anticancer drugs and prodrugs [6,7] . Carbamate bearing potent molecules will be discussed in this article. The natural antibiotic fumagillin 1, inhibits endothelial cell proliferation in-vitro and tumor-induced angiogenesis in-vivo, by inhibition of methionine aminopeptidase-2 (MetAP-2), has entered clinical practice in 1992. Replacement of unsaturated ester chain at C-6 by an O-(chloroacetyl) carbamoyl moiety resulted in the potent anticancer compound 2 (TNP-470, IC50=0.43 nM), which is 50 times more active than fumagillin (IC50=0.63 nM). Recently, a new fumagillin-biotin carbamate conjugate 3 (IC50=60 nM) was synthesized with urethane backbone containing a longer chain (27 atoms) showed excellent inhibitory activity against HUVEC proliferation as compared to mother compound fumagillin 1 (IC50=6.6 nM) . Paclitaxel 4 (Taxol), a polyoxegenated naturally occurring diterpene alkaloid was first isolated from the bark of Taxus brevifolia Nutt., considered as one of the most important and promising anticancer drug mainly used for the treatment of breast and ovarian cancers . Docetaxel 5, (formed through the replacement of benzamide group to tert. butyl carbamate in taxol), shows a similar spectrum of action compared to Taxol but with a fourfold increase in potency and improved water solubility . Staurosporine derivatives are indanocarbazoles alkaloids natural products 6 bearing a sugar moiety, whose carbamates derivatives have been synthesized using an intermediate obtained from aglycone isostere alcohol and tested their kinase inhibiting activity in various cancer cells such as PKC, Trka, FGFR, VEGFR, IRK CDK5. It was realized from the one of carbamate compound 7 (IC50=8 nM) which was most potent in Trka kinase inhibiting activity, and majority of compounds have shown 4-20 fold more potent than the parent alcohol . Betulin is a main component of birch bark and can be synthetically converted to betulinic acid 8, were reported to display melanoma-specific cytotoxicity and the favourable therapeutic index have made it an attractive and a very promising anticancer agent. Two of the imidazole and triazole carbamate compounds 9 (IC50=1.1 μM) and 10 (IC50=1.8 μM) were found most promising, being upto 12 fold more potent than betulinic acid 8 (IC50=21.5 μM) against human PC-3 cell lines . Podophyllotoxin (PPT) 11 is one of well-known naturally occurring aryl tetralin lignans, is extracted as main component from the root and rhizomes of Podophyllum species such as P. hexadrum and P. peltatum whose medicinal properties have been well recognized from centuries. A second series of C-4 carbamates analogues 12 having lactone ring carbon 13 to 11 (called retrolactone) have been synthesized and evaluated, it (IC50=0.088 μM) displayed potent cytotoxicity against the L1210 cell line (10 to 20 fold higher than anticancer drug etopside) and proved to be strong topoisomerase II poisons more potent than etopside . There is plethora of biologically potent molecules whose anticancer potency has increased manifold due to incorporation of carbamates. Here we have discussed some of the important molecules, other molecules like Rhazinilam, Vitamin D3, Staurosporine, Mitomycin C, etc. which shows carbamate induced high anticancer activity. Our group is working to make new developments in this field and we hope in the near future we come up with some exciting Results. Chaturvedi D, Ray S. Various Approaches for the Synthesis of Organic Carbamates. Curr OrgSynth2007; 4: 308-320. Chaturvedi D, Ray S. Versatile Use of Carbon Dioxide in Synthesis of Organic Carbamates. Curr Org Chem2007; 11:987-998. Chaturvedi D. Recent Developments on the Carbamation of Amines. CurrOrgChem2011; 15: 1593-1624. Chaturvedi D. Perspectives on the synthesis of organic carbamates. Tetrahedron 2012; 68: 15-45. Chaturvedi D, Chaturvedi AK, Mishra V. Carbon dioxide: Versatile, cheap and safe alternative in the syntheses of organic carbamates. Curr Org Chem2012; 16: 1609-1635. Ray S, Chaturvedi D.Application of organic carbamates in drug design. Part 1: Anti-cancer agents-recent reports. Drugs of the Future 2004;29:343-357. Ray S, Pathak SR, Chaturvedi D. Organic carbamates in drug development. Part II: Antimicrobial Agents-recent reports. Drugs of the Future2005; 30: 161-180. Zhou GC, Liu F, Wan J, Wang J, Wang D, et al.Design, synthesis and evaluation of a cellular stable and detectable biotinylatedfumagillin probe and investigation of cell permeability of fumagillin and its analogs to endothelial and cancer cells. European J MedChem2013; 70: 631-639. Fu Y, Li S, Zu Y, Yang G, Yang Z, et al. 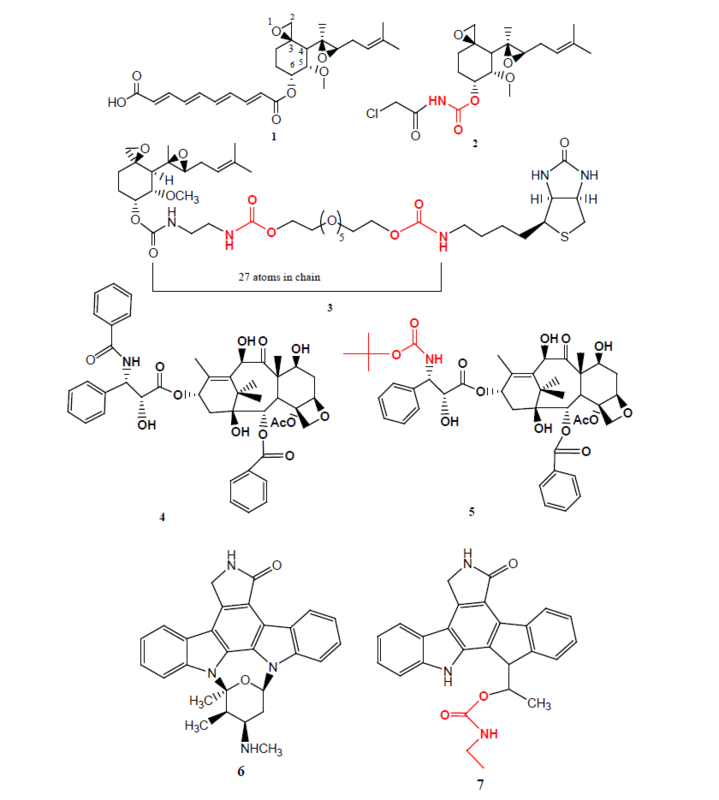 Medicinal chemistry of paclitaxel and its analogues. CurrMed Chem2009; 16: 3966-3985. Breen EC, Walsh JJ. Tubulin-Targeting Agents in Hybrid Drugs. CurrMedChem2010;17: 609-639. Tripathi R, Angeles TS, Yang SX, Mallamo JP. TrkA kinase inhibitors from a library of modified and isosteric Staurosporineaglycone. Bioorg Med Chem Lett 2008;18:3551-3555. Mukherjee R, Kumar V, Srivastava SK, Agarwal SK, Burman AC. Betulinic acid derivatives as anticancer agents: structure activity relationship. Anticancer Agents MedChem 2006; 6: 271-279. Xu H, Lv M, Tian X. 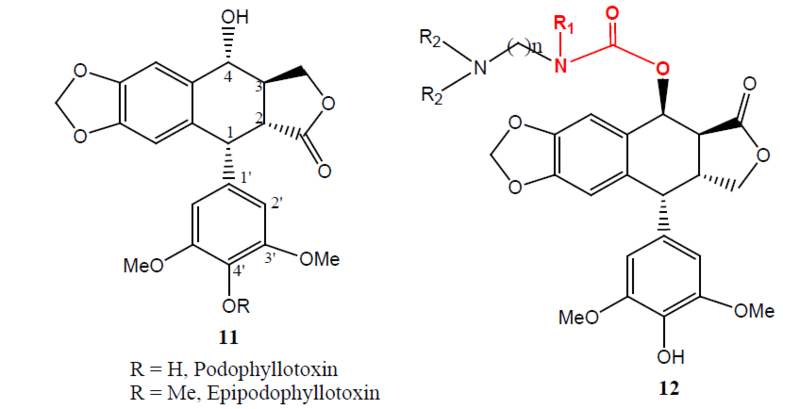 A Review on Hemisynthesis, Biosynthesis, Biological Activities, Mode of Action and Structure-Activity Relationship of Podophyllotoxins: 2003- 2007.CurrMedChem2009; 16:327-349.